Luis Jimenez, Fiesta-Jarabe, 1991-97, fiberglass with jet aircraft finish. It's always fun to see other countries' takes on border crossings. Eastern European countries Georgia and Armenia are planning a beautiful re-design of their border crossing, led by architect Luka Machablishvili. We also have some art featured at border crossings. The FAC's Luis Jimenez sculpture is one of five versions of "Fiesta-Jarabe," and another one in the series can be found at the Otay Mesa border crossing in California. Jimenez was an American sculptor of Mexican descent, and died in his studio in New Mexico while working on the Blue Mustang at Denver International Airport (which fueled rumors of DIA being haunted). 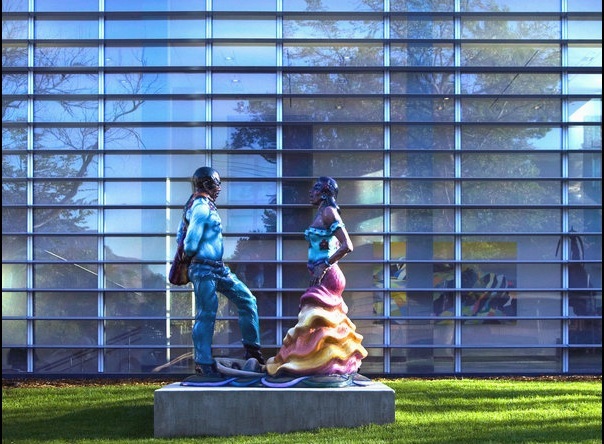 Jimenez was most well-known for his large colorful sculptures that depict traditional Southwestern or Hispanic themes. Jimenez was killed by the Blue Mustang in 2006 when part of the 32-foot sculpture fell and severed a major artery. The mustang was carried to completion by his son and now stands in a street median as you drive up to the DIA terminals. Otay Mesa border crossing is one of two service ports in San Diego, the other being San Ysidro. "Fiesta-Jarabe" stands over nine-feet tall, and includes a vivid polychrome palette. Check out "Fiesta-Jarabe" out front of the FAC, or if you find yourself going to Tijuana, you can check it out in front of the Otay Mesa Administrative Buildings. Luis Jimenez, Blue Mustang, 2006 (source). "Floyd D. Tunson: Son of Pop" GUEST POST!